“Torpedoing.” “Toasted.” The food that Quiznos is having trouble selling is full of metaphors for how its business is going. Crunched by the recession, its own policies towards franchise owners, competitors adding toasters, and an “everyday value” strategy that ran counter to its position as a purveyor of premium sandwiches, Quiznos is on the edge of violating its loan terms and could go into default. WSJ reports that Quiznos told lenders on July 8 that they would soon violate the terms of their loans, which could set off calls for its debt to get repaid immediately. Quiznos said that sales at stores open over a year were down 13% in May. Squeezed by both revenue being down and a high debt load from a leveraged buyout in 2006, they just haven’t been able to cut the mustard. 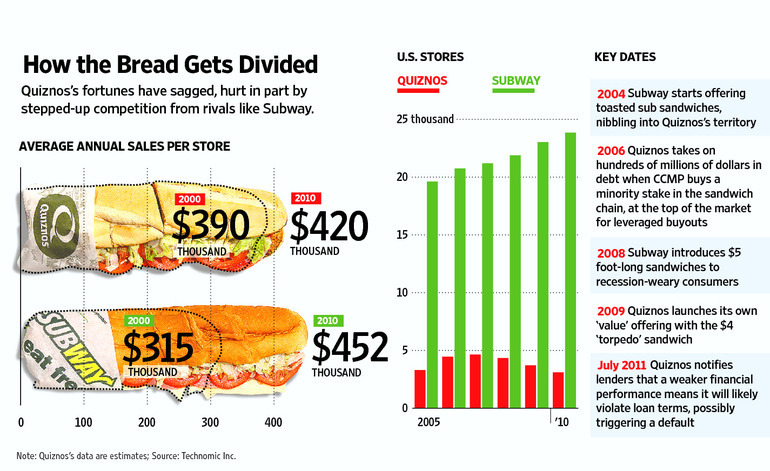 And this chart shows just how badly Subway has been eating Quiznos lunch for the past few years. One franchise owner told the WSJ that the only way to stay afloat was to buy his supplies at Sam’s Club and set his own prices, violating company policy. Quiznos makes franchisees buy everything, not just the food, from them. But if the franchises go out of business, then Quiznos loses out on another big chunk of how they make money, royalty payments from stores. There are about 3,500 Quiznos out there, down from 5,000 in 2008. If you’ve got any Quiznos coupons, now’s a good time to cash them in.